In her sculptural and assemblage works, artist and landscape architect Caroline Sharp takes the natural world as a starting point using a variety of natural materials including her own charcoal, clay, chalk, willow, poplar, birch, hazel, dogwood stems and leaves. Her main focus is on sustainability and treading the land gently. Much of her woven work is strongly influenced by natural form, containment and movement. More recently she has explored ideas in response to the craft of charcoal burning and her autobiographical journey in relation to walking the land and the memory of place. Recent solo shows have been at Devon Guild, Walford Mill, Black Swan Arts and in 2014 at the Crafts Study Centre, Farnham. Other selected group exhibitions have included Whiteout at Contemporary Applied Arts, London and Fresh Air, Quennington, Glos; and various site specific public installations for the Wessex Ridgeway, Crafts Study Centre and Dorset County Hospital; work in both private and public collections including Bournemouth University Wellbeing Centre. Represented by Contemporary Applied Arts, London and the Devon Guild. South West based. Caroline’s response to the project has been to focus on the unique sense of place and the synergy between the exposed rock substrate and the subsequent colonisation of plants within the disused quarries, particularly West Down Quarry. It is a pioneer tree and 18000 years ago after the last Ice Age, it was this cold tolerant species that spread across the tundra establishing the earliest forests. Great clouds of fine seeds were blown by the wind and seedlings took hold and colonised the land as the ice retreated. The inner toughness of Birch is in stark contrast to its delicate twiggy form and its purple twigs contrast with its white bark. The trees have colonised at all levels of the quarry sides – on seemingly impossible tiny ledges where there are the beginnings of soil formation or cracks in the rock where water drains down. They are survivors! Hazel and Buddleja are the other dominant pioneers species found mainly on the quarry floor. The woven hanging Caroline is showing within the exhibition at Black Swan Arts is influenced by this layering of rock/geology and consequent layering of the birch colonisation; the visual contrast between purple and white (in winter); the use of birch and hazel (the two pioneers). 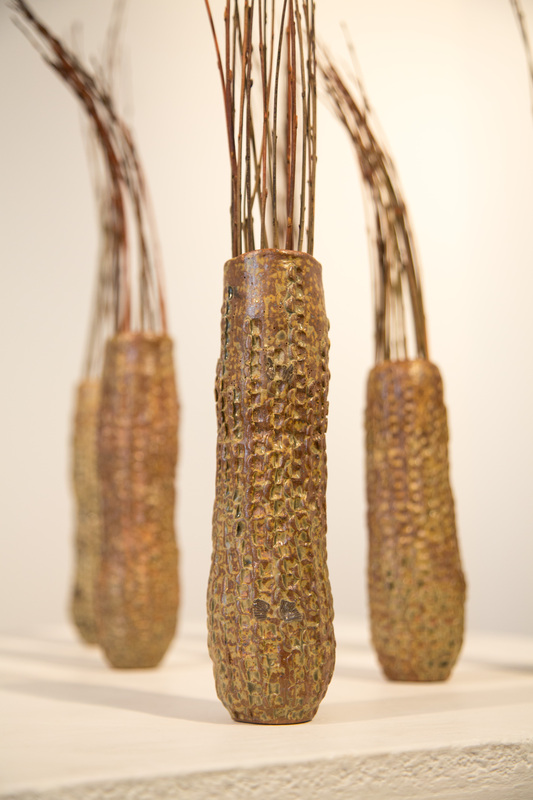 The collection of seed forms reflects the windblown catkin seeds typical of both birch and hazel. Using a mix of stoneware clay and clay from seams excavated as part of the modern day quarrying process at Whatley Quarry and collected stems; Caroline has sculpted forms which evoke these catkins and their windblown nature.